"When it's time to shoot, shoot. Don't talk." Nail guns can be had for well under a hundred bucks these days. West Hills Wood got one a few years ago after absorbing multiple hammer-related finger strikes during the window frame project. 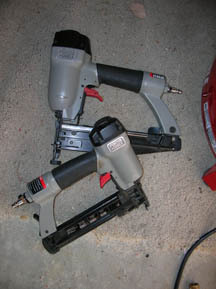 Actually, we got two nail guns along with a small compressor to power them for $199 at the local home center. A better beginning woodworker tool investment cannot be made. Standard air nail sizes are 18 and 16 gauge and offer a variety of lengths. Choose the ones that match your need and go from there. Most woodworkers will not need guns capable of driving nails into 2x4s. We use a lot of 1 1/2, 1/2, and 5/8 nails. You can use glue in the joint if you want, but it's not always needed. Yes, you will need air power to operate these tools. It doesn't take much. 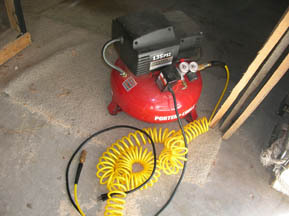 Make certain your compressor operates within the amperage allotments of your shop space. We had a nice Craftsman compressor that would always trip the breaker upon second startup. We sold it at a loss. Don't do that. Our smaller unit is matched to the guns and is small/light enough for us to haul around the house when the need calls. Most "systems" will come with the needed connectors to hook everything up. Ask the sales guy directly. Go so far as to take the unit out of the box and have him show you how to connect everything. It should be easy. It will tweak you in uncomfortable ways if you get that $200 box home and can't use it right away. Using a nail gun is simple enough. Press lightly and shoot. 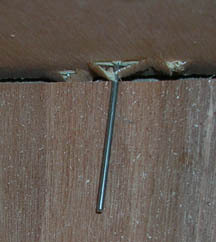 Be careful about where your support fingers are because if the nail misses the board, it can get into your finger in short order. That fits into the "bad things" category. You should be able to adjust for the depth of head penetration. For most applications, getting just below the surface is sufficient. Practice a couple of times. If it takes more than a few times to get the hang of it, return the thing and use a hammer.